Side Gig – Get Paid to Be the “Eyes” for Companies Making Purchases or Loans – No Experience Necessary – US, UK, CAN, AUS – We were contacted by the Recruiter for QuikTrak and she informed us that applicants can now use EITHER an Android or an iOS cell or tablet to perform the assigned duties. Good news for Apple users who didn’t meet the criteria previously! The company pays independent contractors to perform floor-plan audits and leasing inspections as needed. Inspections typically include things like photographing business equipment, locating and checking serial numbers on equipment, and making notes about any damage. Base pay rate per location is $25. More complex inspections pay at a higher rate. There is also “per unit” additional pay and travel compensation. “We Got Hired!” Congratulations to the Latest RRR Job Finders! – Please join us in congratulating the latest group of RRR job finders! Well done, everyone! 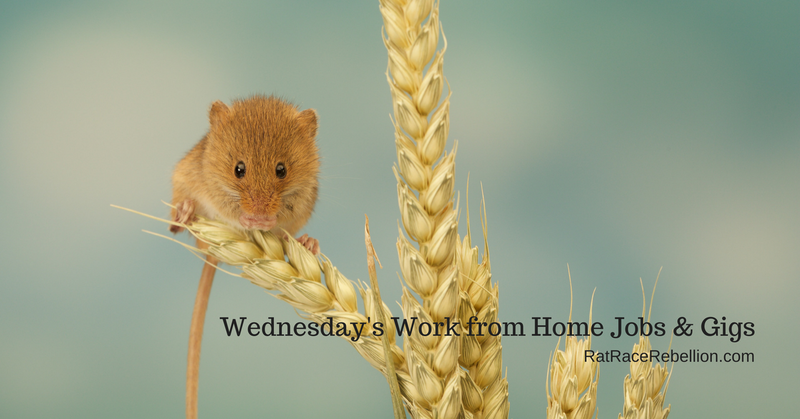 We hope you love your new work from home jobs & gigs! 45 Work from Home Jobs that Don’t Require a College Degree — Lots of people don’t have college degrees. And many work from home jobs and side gigs don’t require them. Here are 45 open now. Some are part-time or work-when-you-want, and others are full-time.